Composed of a continuous glass woven cloth base impregnated with a silicone resin binder, this grade has excellent heat and arc resistance. It has extremely good dielectric loss properties under dry conditions and good electrical properties under humid conditions, although the percentage of change is high. NEMA grade G7 Glass-Cloth Reinforced Silicone -- natural color is typically cream to white. Composed of a continuous glass woven clothe base impregnated with a silicone resin binder, this grade has excellent heat and arc resistance. 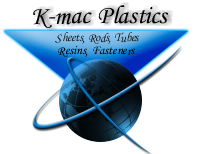 (Silicone thermosetting resins are among the best of all polymer materials in resistance to temperature. Hence, silicone is broadly used for high temperature electronic applications requiring low electrical losses. Silicone isn't as strong as epoxies and phenolics upon aging at lower temperatures but is stronger upon aging over 400° F.) G7 has extremely good dielectric loss properties under dry conditions and good electrical properties under humid conditions, although the percentage of change is high. 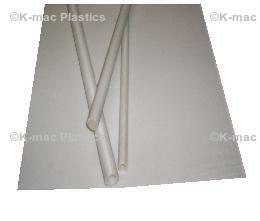 4 Ft. Standard Lengths, lead times may apply on some diameters.